Katy, TEXAS (May 13, 2014) – Katy Visual & Performing Arts Center (KVPAC) is extremely proud to recognize our most outstanding volunteers with the Presidential Volunteer Service Award ceremony this past Saturday, May 10, 2014 at the closing performance of How To Eat Like A Child, a KVPAC Junior COMPANY spring production. Award recipients honored on Saturday by Gregory Magyar, KVPAC’s Executive Artistic Director, were Silver Level winner Chase Fontenot and Gold Level winner, Brian Connolly. Other recipients, not present at the ceremony, were Julia Rodriguez and Leslie Power (both Bronze Level) and Taylor Power (Silver Level). 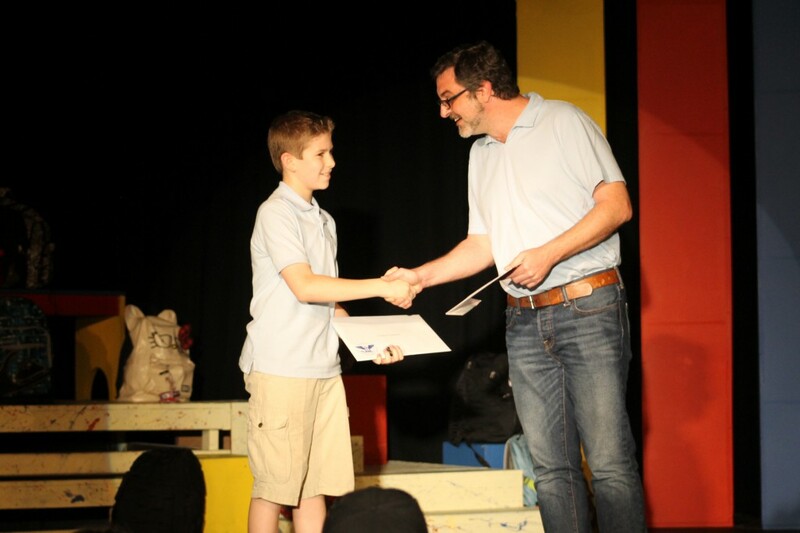 Chase Fontenot receives his Silver Level Presidential Volunteer Service Award from Gregory Magyar, Executive Artistic Director at KVPAC, on May 10, 2014. “I didn’t mind helping out,” said Brian Connolly, a local 8th grader. “The time goes by real fast working on different projects.” Connolly, who logged over 150 volunteer hours last summer, participated in KVPAC’s Young Artists Learning Leadership (Y.A.L.L.) Program. This specially designed student volunteer opportunity is open to all, ages 13 and above, each summer. The President’s Volunteer Service Award was established in 2003, by President George W. Bush to give Presidential recognition to individuals, families and groups who meet requirements for volunteer service, measured by the number of service hours performed over 12-months. These hours include all service hours given to any organization. The award was created to help foster and encourage a culture of volunteer service and civic participation among Americans. Individuals must log their hours on the national website. Awards are determined by age and hours of service. It is our hope, that as a verifying organization for this National Award, we can encourage others to become volunteers, especially for KVPAC. For more information about the President’s Volunteer Service Award Program, please visit the KVPAC website at www.kvpac.org and click on Volunteers at the bottom of the Home Page. KVPAC is a 501c3 non-profit arts education organization serving the Katy community since 2001. We are located at 2501 S Mason Rd, # 290, Katy, TX 77450 in the Great Southwest Equestrian Center Complex. Our second location is inside the West Oaks Mall at 2600 Hwy 6 South, Houston, TX 77082, Suite # 504.